Traditional prepaid electric meter is normally working by the means of Multi-Card One Meter, electricity consumption measurement or No Card to deduct the purchased electricity (unit: kWh ) after being inserted into IC Card. However, the price fluctuation of electricity market which cannot reflect in the purchased electricity will increase the losses of Power Company. For this purpose, a new designed prepaid electric meter Model No. DDSY150 D/F/A issued by Radarking adopts the electricity fee ( Unit: CNY) way, that is, when the fee is transmitted into through Client IC Card and the meter will deduct the price of electricity ( 0.1kWh as base ) according to the unit price, which is set on the IC Card to be transferred into the meter. When the electricity rate changes, the unit price of electricity in the meter will also be changed through the communication medium IC card that the modified unit price are written into from the vending system. 1. Product's Type-- One Card One Meter, Multi Cards One Meter, One Card Multi Meters, Special Load Identification. 2. 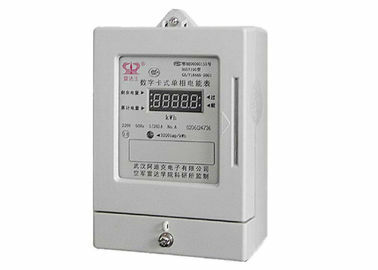 Electric Power Measurement-- Positive active power and reverse active power which can be measured. 3. Prepayment-- IC Card prepaid, electricity sector receive energy charge in advance through selling IC Card. User pay first. 4. Ladder Billing-- Two schemes for electricity price. It can automatic changeover when at promissory time or reach certain value. 5. Manner of Working-- Warning/Overdraw Manner. Warming/Overdraw electricity, maximum accumulations can be set. 6. Protections-- Over Voltage, Over Current, Over Load Protections. 7. Display Method-- LED or LCD display the rest electricity(charge), cumulative electricity consumption, current power in alternant way. 8. Reliable Design-- Perfect power source and electromagnetism compatible design, which are suitable to the strong electromagnetism disturbance and big occasion of power source fluctuation. 9. Cover for Meter-- Fully sealed dustproof and waterproof design, material of cover has excellent flame retardant and anti-corrosion, anti-aging properties. 10. Interface Protection-- Perfect interface protection circuit, which keeps the meter from all kinds of vicious attack, no damaging for meter, no lose for data, and no delay for active. 11. Communication Mode-- Infrared, RS485 interface or carrier communication module (Optional). 12. Power Supply System-- Three-phase power supply or it can work while just one phase has electricity if three phase four wires.